Heterozygous Scn2aA263V mutation (M/+) leads to an exacerbated EAE disease course without altering immune responses. (A) Kaplan-Meier survival analysis of male EAE mice after immunization with MOG35–55 (wild-type: n = 9; M/+: n = 11; P = 0.02). (B) Clinical disability scores and (C) body weight changes of female EAE mice after immunization with MOG35–55 (wild-type: n = 13; M/+: n = 20; two independent experiments). (D–F) Representative histopathological stainings and quantifications of whole cervical spinal cord sections (D) or dorsal columns (E and F) of diseased mice 14 days (D14) or 30 days (D30) after immunization (n = 3–4 mice per group with 2–4 color-coded slices per animal). Sections were stained for cellular infiltration (D; H&E, sample images from D14), myelin (E; Luxol fast blue [LFB], sample images from D14), and astrocytes (F; glial fibrillary acidic protein [GFAP]). For each quantification, multiple replicates of data from individual animals were color coded (D–F). Scale bar: 100 μm. 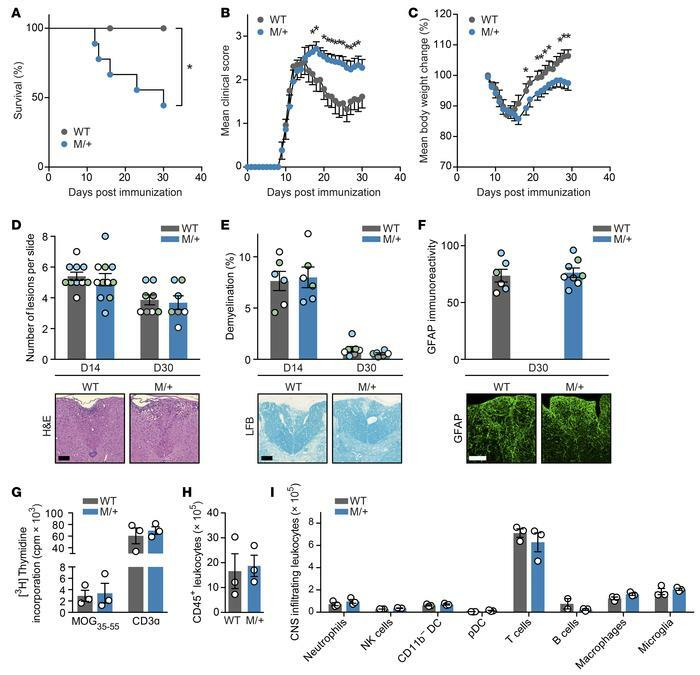 (G) Single-cell suspensions of draining lymph nodes were prepared 7 days after immunization from wild-type EAE (n = 3) and M/+ EAE (n = 3) mice, and restimulated with MOG35–55 peptide. T cell proliferation was assessed by incorporation of [methyl-3H]thymidine. CNS-infiltrating cells were isolated 15 days after immunization from wild-type EAE (n = 3) and M/+ EAE (n = 3) mice, and the total number of CD45+ leukocytes (H) and the leukocyte subsets (I) were analyzed by multicolor flow cytometry. All data are presented as mean ± SEM. Statistical analyses were performed by Gehan-Breslow-Wilcoxon test (A), Mann-Whitney test (B and C), 2-way analysis of variance with Sidak’s post-hoc test (G and I), or Student’s t test (D–F and H); *P < 0.05. Color coding has to be evaluated separately for each graph, i.e., each color represents one particular animal at one specific time point for one particular parameter.